You can locate a patient's past, future, and recare appointments from that patient's record. Then, if necessary, you can view that appointment on the schedule. On the patient's Overview page, the Appointments box displays the patient's next and last appointments and the number of missed appointments. 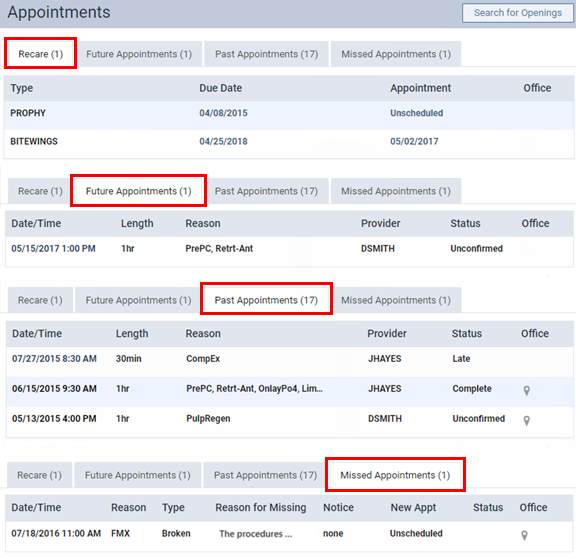 The patient's Appointments page lists all the patient's recare, future, past, and missed appointments. Click (or tap) the Date/Time link of an appointment to view that appointment on the schedule. The Date/Time is a link only if the appointment pertains to the location being viewed. You can click (or tap) an appointment's Office icon to view the location that that appointment is in. On the Recare tab, primary recare types are bold for quick identification.